Could my accident from 2 years ago be the cause of my neck pain? The short answer is yes. But let’s look at how the neck is injured in whiplash and why a trauma from years earlier can produce symptoms today. Even in more moderate motor vehicle collisions with substantial car damage, symptoms rarely come on the day of the injury. When symptoms do occur immediately, this is a sign that the injury to the neck was more severe. In most accidents, we initially feel a bit shaken up and shocked more than anything else. 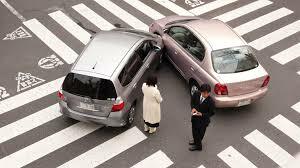 When the vehicle has substantial damage, this can completely occupy our thought. How are we going to drive to work the next day? We may not think to see a doctor immediately because a more pressing concern is to get the car into the shop and arrange for a rental. If a pain in the neck begins, we take a few pain pills such as ibuprofen and the pain seems much better, even cured. But whiplash is much less straightforward than a simple tight muscle from over exertion. Whiplash causes the neck bones to displace from the stretched ligaments and discs. Over months the bones gradually creep further into the direction of the damaged ligaments. Since gravity is working all of the time, the tendency over time is for the misalignments to get worse. Once a critical threshold is reached, the nerves become irritated and the pain develops. An initial little problem has now become much worse because the neck has healed in this abnormal position. The scar formation that occurs after injury is now holding the neck in an abnormal position. When an injury occurs we may adapt or compensate to the abnormal position. But over time the limits to this compensation are passed, producing pain. Because of the scar formation that develops after an injury, the joints of the spine may not move normally. To compensate for this limited motion at some joints, others have to take up the slack. These joints then become hypermobile, producing irritation to the nerves and spinal cord. The hypermobility is produced by stretched-out ligaments. As months, and even years, pass, the stretched ligaments become even more stretched due to the effects of gravity and the movements of our head in everyday life. The athlete may notice these changes right away because their physical performance is something they are very accustomed to. In someone with a more sedentary lifestyle, the neck pain, stiffness, or headaches may come on months or even years after the injury.